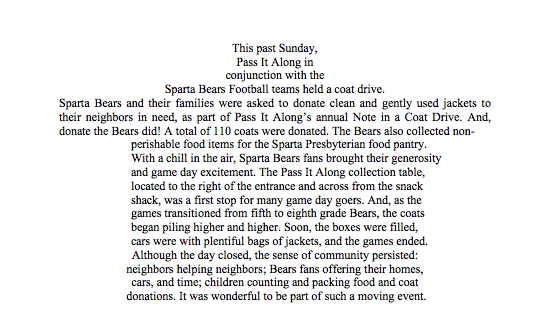 0	Pass It Along and Sparta Bears play to win for coat and food drive victory! I arrived at the House of Mercy Mission in Newark on Saturday morning for Pass It Along’s Cooking With a Mission program. I was immediately greeted by two church volunteers and given a short tour of the place, before heading down into the kitchen area. In the kitchen, I joined the other Pass It Along volunteers and the program’s work began. First, we unloaded trays of chicken, rice, and beans (the lunch meal for the day) and then heated them in the ovens. While the food was warming up, we began packing plastic bags with water bottles, bananas, and sugar cookies. Shortly thereafter, the food was ready and we loaded portions of the chicken, rice, and beans into Styrofoam trays. We then placed the trays into the plastic bags filled with the other goodies and began piling them, so that the lunch could be brought up to those on the receiving end. At times, the voices of the practicing choir could be heard, which created a serene working environment. Once the lunches were all packed, we helped distribute them to the church’s beneficiaries along with House of Mercy Mission volunteers. In addition to the lunches, sweets, bread, tomatoes, and onions were also given out. It was a powerful part of the day. I saw individuals of all ages, including those whom seemed to be of a similar age to myself (which was particularly jarring), and families, many of whom had small children with them. The majority thanked me. They thanked me for something I take advantage of at least three times a day without a moment’s thought. Their gratitude was overwhelming and extremely humbling. It reminded me just how blessed I am. I was happy to show up early to Pizza Bistro to pick up the food for our Cooking with a Mission program this past Saturday. Tim, the owner, head chef, and Culinary Institute of America grad, is a wonderful culinary artisan…on top of being just the kindest and enthusiastically sarcastic person. A visit to the restaurant is always a great way to start the weekend. I was quickly prepped, pep talked, instructed, razzed, and sent on my way from Sparta to the Mission. There was work to do. My drive was complicated by the intoxicating aroma wafting from the carefully stacked trays, which effectively “ate up” all the available real estate in my vehicle. 150 lunches translates to A LOT of food and supplies, even just for one simple meal. I did manage to resist pulling over to sample the wares, though, and completed the short trip to Newark enveloped in a cloud of yumminess. When I got to the Mission, everything from there happened in a blur of activity: parking, unloading, oven-loading, lunch bag prepping, and scooping, scooping, scooping, scooping. When my back started to hurt from being hunched over the long folding tables stuffing food and water bottles in lunch bags, I could feel myself getting a little cranky, until it hit me: what would make me more uncomfortable and cranky? Being hungry, or dealing with a little back pain? The answer was swift and unwavering. I find hunger to be extremely disruptive: I can’t concentrate, I get headaches, not to mention the dourness that overcomes my mood when I’m running on empty…and those are just effects from running a few hours behind on my meal schedule. The back pain is highly temporary and can be relived by walking it off and improving my posture. With this eye-opening perspective, I quickly redoubled packing efforts after a short shoulder stretch. My absolute highlight of the day, though, was getting to see some of the Tilly’s Kids from our summer programs at Swartswood State Park and Tilly’s Camp, who just happened to stop by the Mission on Saturday. I was greeted by surprised smiles, “What are YOU doing here! !’s,” and hugs, hugs, hugs. Wonderful does not begin to describe the reception we received, and their smiling faces were alone well worth the drive to the city—not to mention the appreciations sounded by adults who were recipients of the noontime meal. Sadly, the program is not offered in November or December, since there are other holiday and outreach events happening at HOMM, so it’s likely that I won’t see another Cooking with a Mission program during my tenure as a PIA AmeriCorps. But, who knows? Maybe I will make a cameo appearance in CWAM in 2014! Fall. It’s here. It’s amazing. The leaves are turning colors, lots of them are already on the ground, and that fabulous fall weather with low humidity, azure blue skies, and still-decent hours of sunlight, too. 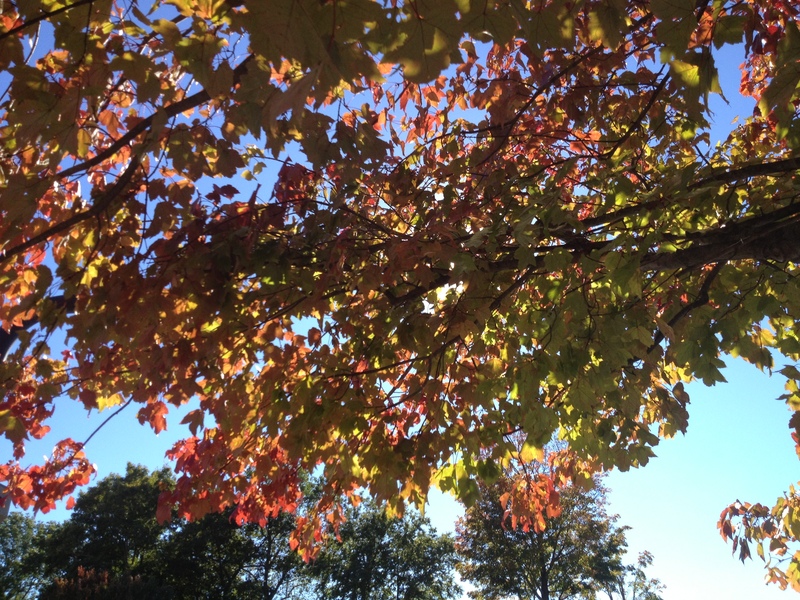 Fall colors, as seen from the PIA office. As beautiful as the fall is, it brings with it the threat of winter. Not so long ago, winter was a harsh and scary time for families, as many things that winter brought with it, such as food scarcity, illness, and extreme weather, were considerably more difficult to overcome than they are today. Though we have made great strides in overcoming the obstacles that winter offers up each year, there are still many for whom winter is a tough time. It costs money to heat one’s living space, to buy winter coats, and to keep the pantry stocked with food for warm meals. It costs money to salt the walkway when it snows, to put snow tires on the car so one can get to work and school safely, and extra trips to the gas station, as fuel economy dips along with the thermometer. For people already living close to the edge, the added expenditures of winter can quickly mean the difference between paying the heating bill and buying a new coat for a child whose old one is too short in the sleeves and too tight in the shoulders. It could mean the difference between paying for produce (now at premium prices, as the local growing season is over) and paying for proteins (the most expensive part of most meals). So, with these and other hardships in mind, we are preparing to do our part to help out those for whom these choices may be all too real. One way we are helping is through our Note in a Coat drive. In the event, clean and gently worn coats are collected throughout the county; inspirational notes are tucked into the pockets; and the coats are then distributed to people who need them. Children’s coats are especially needed. Public collection sites are Andover Cleaners and Tailors, Betty Brite Cleaners of Sussex, E & A Cleaners and Tailors, First Hope Bank—Sparta, Franklin Dry Cleaners, Lafayette Dry Cleaners, and Vernon Plaza Cleaners. Another event that Pass It Along is running that assists those in the winter months is Family Volunteer Day. Family Volunteer Day brings Thanksgiving to tables that would otherwise lack a traditional holiday meal. Families, teams, clubs, and other groups are encouraged to “adopt” a family in need by bringing all the nonperishable parts of the meal and a frozen turkey to the event day. The entire meal is then boxed up, the box is decorated, place mats and cards are created for the meal, and other activities to support the recipients of the meals are completed. After the volunteers depart, the families come that same day to receive their Thanksgiving meal. I can almost guarantee that thankfulness at your Thanksgiving will likely be on a different level if you choose to participate in the Family Volunteer Day event. Think about it. Many hands are needed—are yours willing to help? It’s game time at Merriam Avenue’s school gym! S.C.A.R.C. participants and Pass It Along volunteers have just finished their stretches and pre-game warmup, which consisted of foul shots, lay-ups, and some running laps. The referee dons his striped shirt and whistle, and the players are divided into two teams. The whistle blows and the teams are off! David takes the ball first, moves down the court, and scores. It’s a swish! “Shorty,” (an affectionate nickname on the court for this player on the opposing team) dribbles down to his team’s basket, shoots, and… nothing but net! The game continues in much the same way with the two teams going shot-for-shot. Then, near the end of the game, the energy on the court intensifies–what the players and volunteers know as “showtime.” The hustle is serious. Players make what would be considered three-point shots and passing plays are implemented by the team coach & S.C.A.R.C. activities director, Dave. The game ends in a tie, and all are pleased, if not downright ecstatic, with their performance, and volunteers and players alike are energized by the activity. So, I’m just going to come out and say it. At Pass It Along, there are so many things that jazz us up – a lot— about the annual Youth Conference that we hold at the McNeice Auditorium at Sussex Tech High School. One, this is a “by-youth, for-youth” event. So there are a lot of opportunities for our high school committee to show us—and their peers—how it’s done. The committee started meeting in the summer months, when school and October couldn’t be farther from most people’s minds. They starting planning themes, workshops, deciding who the speaker would be, creating marketing materials, and hashing out what they wanted the event to look like during their summer vacation. I commend them for their dedication to the cause, even as most kids (and adults, too!) were taking a break from school and all things school-related. 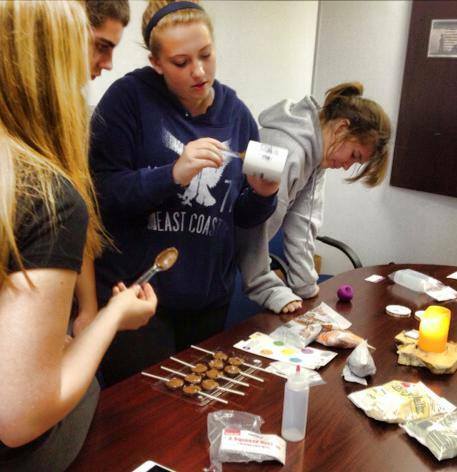 Youth volunteers handcrafting lollipops for St. Peter’s Orphanage residents. Two, when I talked to president and CEO Diane Taylor about the event, she dubbed it “one of Pass it Along’s not-to-miss events.” I was thinking about taking a few days off, and it was potentially going to be over that week, so I went to Diane for guidance. I was greeted with an open mind about my potential plans, but was quickly convinced by her persuasive argument that Youth Conference is perhaps the most important event, especially for staff members, to experience each year. “It’s the energy, the drive, and the passion for service that the teens bring, that they elevate enthusiasm for service to a level that can be hard find anywhere else,” she said. “It pumps us up for the busy holiday season and for the rest of the school year, too” she said. SOLD. I was going to Youth Conference after that five-minute conversation. 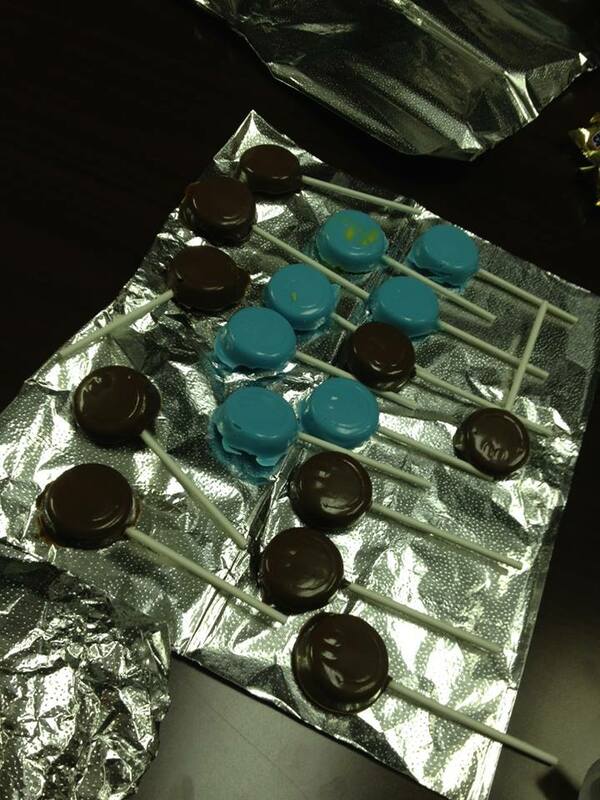 Some finished product from the candy-making days of the YC Planning Committee. Finally, the theme is awesome. It’s “Superheroes of Service,” which (again) was generated organically from the teen committee helping to plan and execute the event. So, expect (this is the short list, at last check) to see: Superman – Batwoman – Catwoman – and Captain Planet. HELLO?! How cool is that? As if you needed any other reason to spend time with Pass It Along…but if for some reason you did need a figurative “push,” consider this it. If your school is attending, we hope you will be there with your school group. If not, you can contact event organizer lynn@passitalong.org to try to work out a plan for you to join us on the 3rd.